4 How Early Can You Make a Wedding Cake? A message or picture on a cake plaque stands out boldly from the rest of the cake. A decoration applied to the finished cake, a cake plaque can be any shape and be decorated with any image desired. Adjust the plaque size according to the size of the cake, ranging from small plaques for cupcakes to large plaques for sheet cakes. 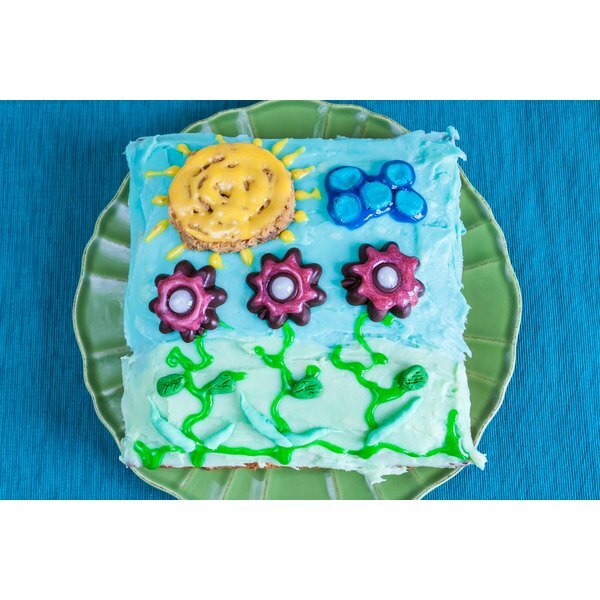 You can make a buttercream frosting plaque using half shortening and half butter. Draw a mirror image of the desired shape for the plaque on regular paper. Tape the paper to a cutting board with the image centered on the board. Tape a piece of wax paper on top of the image. Outline the design on the wax paper with a bold frosting color and fill in the design with the desired colors, using a round decorating tip for application and a small artist's paintbrush to spread it smooth. Outline the entire design outside the original outline, using a larger round tip and the same color used to frost the cake. Spread this frosting color on top of the original design, making the total frosting thickness about 1/2 inch. Freeze the plaque on the cutting board overnight. Flip the frozen plaque over on a cake and peel back the wax paper to transfer the plaque. Using frosting, pipe the desired image or words onto the plaque. Sugar doughs, such as rolled fondant, gum paste and marzipan, can be rolled and shaped much like play-dough. Roll it out to about 1/4 inch thick. Cut out the desired plaque shape with a cookie cutter or a small precision knife. If you don't have a cookie cutter, place a cutout of the desired image on the fondant and cut around it with the precision knife. Try a multi-layered effect on the plaque with a slightly smaller circle set inside a larger, scallop-edged circle. Brush a bit of water on top of the scalloped circle to make it tacky and set the smaller circle on top. Allow the plaque to harden overnight at room temperature. Apply buttercream frosting to the back to act as glue for attaching the plaque to the cake. You can pipe a message on the cake with buttercream, or use small fondant cutters to cut out letters. Turn a chocolate cake into a double chocolate delight with a plaque molded from your favorite chocolate, whether you prefer milk chocolate or dark chocolate. You can also choose from a range of colored melting candies in the cake decorating aisle. Melt the chocolate or melting candies in a double boiler over medium heat. Pour the melted chocolate in your choice of mold depending on your preference for plaque shape. Cookie cutters work well for making small plaques, but you might try the bottom of a loaf pan for large cakes. Fill small molds at least 1/8-inch thick, and up to 1/4-inch thick for larger molds. Allow the chocolate to cool and harden for at least 20 minutes before releasing the molds. Pipe a message or other decoration with melting candies or frosting. Attach the plaque to the cake with buttercream frosting. This cake plaque option gives you two desserts in one with a decorated cookie that you can remove and eat when serving the cake. Bake sugar cookies in the desired shape for the plaque. Outline the cookies with a piping bag filled with royal icing made to piping consistency. Paint the inside of the outline generously with royal icing thinned with water, using a toothpick to push it up against the outline icing. Add a message with regular-consistency royal icing. Allow the royal icing to harden overnight or until it is completely dry and hard. To prevent the cookies from absorbing cake frosting moisture, place a piece of wax paper between the cookie and cake frosting, using a bit of royal icing as glue to hold the wax paper on the cookie.